Speaking with the Greek newspaper "Η Αυγή" (The Dawn) on Sunday 4 November 2012, Metropolitan Hierotheos of Nafpaktos spoke about the current economic crisis in Greece, the political party Golden Dawn, the issue of immigration, and the response the Orthodox Church should take to these issues. The country is facing an unprecedented economic crisis. What role can be played by the Church in this crisis? Is philanthropy enough? The recent economic crisis is indeed unprecedented, as you characterized it. Many think it has geopolitical characteristics and is associated with rivalries between western and eastern economies. Geopolitical strategists want to have the upper hand in our region, especially around the Mediterranean Sea, and global societies have their plans. The Church does not enter into this analysis, but gives meaning to the life of people, continuing the social fabric. Of course, religion is not simply to satisfy the religious feelings of the people, because then it really would be the "opium of the people", to lull people so the powerful can survive by exploiting the people. The Church is a community, as it was felt by the General Makriyannis, who in the name of the Church fought against every incumbent, as shown in his memoirs. The Church must operate with the ancient sense, as a meeting of people, as a church of the municipality, having God as their center. So the Church, as a large family and spiritual hospital, tries to cure the problems of the people. Besides, man has not only a soul, but a body, is not only spiritual, but also has material needs. So the Church practices philanthropy to those in need, as many times it has announced. But this is not the solution. No man wants to be a beggar, but he wants to work and make money to make a living with dignity and toil. He requests work and justice and requires the state to organize, to meet needs, not only to collect taxes, but for taxes to be rewarding in society. What led to the crisis? The Church maintains that it is not only economic but also spiritual. What does this mean exactly as the causes of the crisis? The issue has many sides and everyone can give their own interpretation. If you look at it from a social standpoint, it is found to be the fault of politicians, at least those who exercised power directly or indirectly over the years and could not foresee or overturn what was to come. And it cannot be justified that the opposition, trade unions, journalists, etc. did not allow them to make good policy, because the leader is voted by the people to lead and not be conducted and carried by various forces. However, the Church sees things beyond these matters. Of course, I have to make a clarification. When we speak of the Church, we should not understand some clerics or those few who attend church, but all those who are baptized and live dynamically and actively in the church space. Yet, the crisis is not outside of us but within us. It is a mindset of blissful happiness, exploitation, wealth, and the accumulation of material goods to the detriment of the people and of society itself. This shows tax evasion, consumer loans, opacity in finance. One cannot be a clergyman living with comfort when people around him are starving and suffering. Finally, a major cause of the spiritual crisis that has consequences in society is the existential vacuum, self-love, with all that it entails. This self-love is opposed by divine-love, and philanthropy is the opposition of hate for divine things and misanthropy. Recently, along with numerous other bishops, you spoke out publicly against the Golden Dawn. It has been argued that the practical and political views of this organization is contrary to the essence of Christian teaching. Do you agree? You will have noticed that I expressed myself against racism and violence wherever they come from. I cannot accept as a hierarch ideological systems that have fascist and Nazi attitudes, Nietzschean and inhuman systems, using various methods of biological and social eugenics to override a race against other people. I cannot accept violence against ordinary, poor, weak and defenseless people. Such behaviors very much shock me, they're all anti-Christian and inhumane. However, I am greatly troubled that the generation of the Polytechnic rebelled against the junta seeking a better future,* and in the dictatorship some of them gained power and ruled the country leading the people into this great social and economic crisis. I am greatly troubled why they shatter the dreams of people with nice words like "dictatorship", "change", "socialism", "cleaning up", "modernization", "refounding of the State", "Golden Dawn", etc. With what I say it does not mean that I espouse the offsets, but over the years the system was ill. Ultimately, it is the responsibility of the democratic state to raise democratic standards for the management of the community, to ensure the safety of citizens and foster a democratic conscience in people with the right education. On the other hand, some hierarchs seem to be tied in with the Golden Dawn and welcome some of its policies. How do you comment on this option? The Church is not a political formation to impose party discipline on members and show them how to express themselves. Each hierarch has several problems in their Metropolis and they express accordingly. 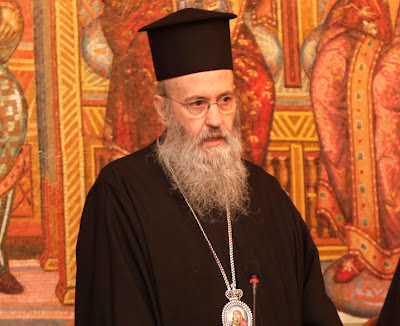 I do not judge statements by hierarchs. I express my opinion and I try to coordinate the action with the word, or rather the word to be the result of the action. I think we should respect the democratic system, as expressed in parliament with the majority and the opposition. But how parliament will operate will have to be regulated by their own politicians. We cannot adopt practices that undermine democracy. In older times there were hierarchs who participated in the "anathema" of Venizelos, they praised dictatorships with hymns, they collaborated with the junta. Such phenomena should not be repeated today by the hierarchs. We must learn from history. The issue of immigration is dividing society. How does the Church believe we need to address this issue? The Greeks of ancient times hid within themselves an "immigrant" and traveled around the world. They became a citizen of each country, without losing their national identity and patriotism. Today, the world with the means available is constantly moving. I do not think legal immigration creates a problem when done within the framework provided by the properly organized state, but problems are created by various immigration centers, making victims of illegal immigrants and the countries protectorates. I think that immigration and illegal immigration must be faced by an organized state, and not angry citizens, by legal principles and institutions with vision, perspective and sensitivity and not with violence. The subject should be treated with seriousness and responsibility, not frivolous motions. It bothers me greatly that people and nations are pawns on the chessboard of international diverse interests. * The Athens Polytechnic uprising in 1973 was a massive demonstration of popular rejection of the Greek military junta of 1967-1974. The uprising began on November 14, 1973, escalated to an open anti-junta revolt and ended in bloodshed in the early morning of November 17 after a series of events starting with a tank crashing through the gates of the Polytechnic.